Note: This post is available courtesy of Joy Riggs, freelance writer and Vintage Band Festival executive committee member. 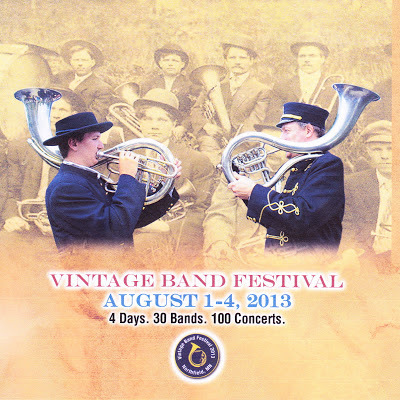 The countdown to Vintage Band Festival 2013 is at 77 days – it’s less than three months away! If you enjoy listening to world-class music, attending family-friendly summer festivals, and exploring cool small towns, make plans now to travel to Northfield, Minn., this summer – the town of Colleges, Cows and Cornets! Thirty bands are scheduled to present 100 concerts during the four days of the international festival, showcasing a variety of genres, heritage influences and period-style performances. Some bands are making a return appearance, and others are new to the festival. Detailed information about the bands, links to their websites, samples of their music, and a searchable performance schedule are available on the festival website, vintagebandfestival.org. New bands this year include Buffalo Bill’s Wild West Cowboy Band, from Texas (also known as the Frontier Brigade Band); the Hypnotic Brass Ensemble, a New Orleans-style band composed of eight brothers from Chicago; and two bands from Sweden, Ehnstedt’s Octet and Medevi Brunnsorkester. This entry was posted in VBF News and tagged Joy Riggs, Vintage Band Festival on May 20, 2013 by Paul Niemisto.